It's a great time to be in grade school, if you live in Japan or Great Britain. Several dozen schools in both countries are putting Nintendo DSs in K-12 classes. Games are no stranger to schools, of course. Think back to the 80s when at least 30 minutes of every school day was given over to drowning your wagon in Oregon Trail in the name of History class, or letting your SimCity fall to ruin through crime and tornadoes on behalf of Social Studies. From the first school-sanctioned games like these to the full-blown edutainment of today, it's safe to say educators are aware of the learning potential in video games. 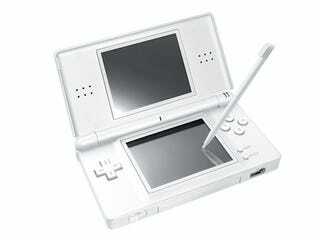 But taking a step further and actually developing a curriculum around the Nintendo DS takes innovation – and money. After all, there's only so far math drills can really take you whether you're on a PC or DS and money for education systems still doesn't grow on trees. Leading the charge toward a Nintenducation in the UK is Scotland. Their Centre for Games and Learning (aka The Consolarium) is an extension of the Scottish Government Schools Directorate that presents teachers and education administrators with ideas for implementing all kinds of gaming consoles into schools. Derek Robertson, National Adviser for Emerging Technologies and Learning and administrator of the Consolarium, says that the use of the DS in schools is now commonplace, compared to when he first introduced the consoles to schools in 2006. "Initially I purchased 30 [Nintendo DS consoles] and carried out my first Dr. Kawashima [aka Brain Age] trial. The extended trial saw us handing out over 450 consoles to support our project." The Consolarium encourages schools to the use the DS for more than just math drills and brain training puzzles. "We suggest that schools follow [the Brain Age] methodology although they are free to trial other approaches," said Robertson. "Our main approach is not to prescribe a series of lesson plans but to suggest how the game, be it Nintendogs or Hotel Dusk, can be used as the contextual hub about which learning in a variety of curricular links can grow from." Translation: students get to play Hotel Dusk. In class. This application of the DS to schools marks a paradigm shift in the relationship between games and education. In the old days (by which I mean the 80s and early 90s), Oregon Trail and SimCity were phased out in favor of more learning-specific software like Math Blaster. There's nothing wrong with dressing up multiplication tables in interactive software, of course. But it did limit learning opportunities to whatever the game was programmed to do and it put teachers in a hands-off role. With games like Nintendogs, teachers get to be creative, designing lesson plans around what happens in the game. For example, teachers in two Scottish schools used the virtual pet sim back in 2008 as a way to tempt kids into reading up on the first dog in space. Students also wrote stories about their Nintendog and competed with their classmates in the in-game competitions for real life prizes from the teacher. This year, another Scottish teacher has used the Nintendogs initiative to launch an art project where students tried to use what they saw in the game to influence the dogs that they drew or painted in real life. Although the success of these programs is hard to measure (aside from teacher, parent and student testimony), something clearly seems to be working for Nintenducation. Robertson said Scottish schools are starting to shell out for their own consoles because they've seen results from the Consolarium's initiative. One school even received a donation offer within the last two months for 2500 DS consoles. Meanwhile, in England, the Consolarium's ideas are starting to catch on. Dawn Hollybone is a teacher at Oakdale Junior School in London where students aged 7-11 are getting their hands on both Brain Age and Professor Layton to further their education. "We use the consoles for 20 minutes a day," she said. "Each year group has a session timetable per day and then I ask that they use it at least three times a week. The use of these is planned into each individual lesson, [so if it's] part of a maths session, then it may be used as a mental starter to warm up… or as part of a Literacy lesson, the class may use the reading aloud programme or syllable counter." Additionally, Hollybone also uses PictoChat as a way to bulk up writing exercises by having students write to one another and collaborate on projects. "In this way they are not merely 'just' playing the games they are used as a way into a lesson or as a plenary," Hollybone said. It all looks incredibly awesome (or maybe we're blinded by jealousy); but there are some concerns that critics have raised over DS usage in schools. There's the obvious "games don't teach kids" arguments we're used to hearing from the Oregon Trail days; but there's also a valid concern about the cost of putting a DS in the hands of every school child. Not all school systems are as small Scotland's or Japan's – and here in the US, the cost of public education through taxes barely covers school lunches, never mind a $100+ console plus $30 games. "I suppose costs are a barrier but if that's all we have to worry about, then great," said Robertson. He said he's more concerned about getting the message out to critics of the methodology itself that games are good learning tools, not some subversive pop culture enemy. "There is still a worry over the media's general propensity to perpetuate the moral panic argument or for the impact to be lost in an intellectual debate, but I feel as though we have managed to change attitudes… and are helping to change attitudes beyond our [borders]." Japan seems to have their back at least — in Kyoto Prefecture (Nintendo's home base), Nintenducation is still going strong in Yawata City after being introduced about three years ago. Last month in neighboring Osaka Prefecture, there were reports that the Osaka Board of Education approved a measure that would allow 10 middle and elementary schools in the area to incorporate the DS into the classroom experience. So what can we expect for the US schools? Nintendo couldn't be reached for comment on this feature, but we did get in touch a middle school history teach and a DS-fluent parent to get their take. Caitlin Ferguson is a 9th Grade Geography teacher at Port of Los Angeles High School in California. She herself doesn't own a DS, but having seen it in the hands of some of her friends, she's vaguely aware of its educational potential. But in a school system where High School students already have regular access to computers, she thinks a Nintendo DS might be overkill. "They're lackadaisical as it is," she said. "If they're getting the work done… I could see using it as an enrichment tool, rather than a curriculum tool." An example of that would be letting students play Brain Age only after they'd completed their regular math assignment – instead of before. Ferguson did acknowledge that teachers could take Nintenducation a step further if the school passed out DS consoles to students. For example, she suggested that a Life Skills class could assign students an exercise where they compare Cooking Mama recipes with real-life cooking recipes and pick out all the differences. Ultimately, though, Ferguson's concern about putting the DS in schools is that it will be a barrier between teacher and student. "There's so much interaction [that happens] between teacher and student," she said. "It can't be replaced by a DS. Neither can the work." Ferguson's concerns about the line between work and play are echoed by parent Julia Temple. Her son is in 3rd grade at St. Paul's Episcopal School in California and for the money she pays, she doesn't want him playing games instead of traditional learning. "I wouldn't be happy if they gave [students] DSs at school," Temple said. "I could see that maybe it would engage children… it could make for a positive experience." But to her, the DS is a toy used for having fun, not for learning; she thinks the time a student spends gaming would be better spent with a book. Temple said she was alright with students learning on computers, though, because she sees them as a part of everyday life that students have to learn eventually. "The DS is very limited," she said. "You can do more on a computer." But, like the critics, Temple's biggest concern is cost: "Ultimately, I don't think they should have DSs in school because we have so many other things we could be spending money on." We may not see Nintenducation in the US anytime soon because of the economy. But if Japan and the United Kingdom show consistent promise with their DS programs, it may be only a matter of money and not of principle that keeps the consoles out of school. Like they say, knowledge is power - and like Nintendo used to tell us back in the 80s: "Now you're playing with power."